I'd like to preface this review by saying that this is one of the finest, if not THE finest compilation I have ever heard focusing on the merits of one label. In this instance it is the Malaco label. In the excellent and informative liner notes by John Ridley he makes the following statement...."No ifs, buts, or maybes, the best real soul music over the last 30 years has come from Malaco in Jackson, Mississippi. Almost alone, they have consistently championed the traditional values of gospel-influenced vocalists singing over tracks crafted by top class musicians, creating music in which depth of feeling and emotional response are the cornerstones. Over 200 singles and 100 secular LPs have come from Malaco so far. This is an amazing achievement. In reviewing compilations the hardest part is prioritizing the tracks, since many similar type compilations are forced to include lesser tracks for the sake of completeness. That is not the case here. My recommendation is to start with the first track and marvel at the glory that unfolds thereafter. Of the 23 tracks that follow only one or two will be familiar to even the most dyed in the wool Southern soul fan. The fantastic "Bluer Than Blue," from Ruby Wilson's only album on Malaco, is a stunner. A frequent performer over the years on Beale Street in Memphis, she possesses a voice of unequaled beauty. Those of us that have had the privilege of seeing her perform here in Phoenix will always have fond memories of those shows and await her return to Arizona. Another performer who absolutely shined in her appearance here in Arizona was Dorothy Moore, represented here by her "Two Of A Kind," a 1974 single that came out on the subsidiary Chimneyville label a full two years before she hit the charts with "Misty Blue." Another Chimneyville track is the oh so soulful "The Town I Live In" by the great McKinley Mitchell, who passed away in 1986 from a heart attack brought on by diabetes and his lifestyle. That song has appeared on several other CDs. Sam Dees is a seasoned singer and songwriter and is represented by three tracks; the CD opening "Troubled Waters" and the closing "My World" are of the highest order. 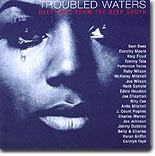 Tracks by lesser known artists, such as Jimmy Dobbins ("A Quitter Never Wins"), Joe Wilson ("When A Man Cries") and Carolyn Faye ("Warm Lovin' Man") are classic deep soul tracks. The legendary Tommy Tate is given two cuts. My absolute favorite track is the gospel laced "I'm Praying," by Charles Warren. When the word righteous was coined, they must have listened to this track first. My utmost appreciation to Grapevine for this release. The booklet is informative with bios and pictures of the artists and labels, and even the booklet cover has a great picture. This release should not be missed. Peachtree Records has always been a label that collectors of rare 45s have endlessly searched for. Almost all the tracks here are new to CD and most of the tracks were never reissued in any form since their original release over 30 years ago. With this compilation, music that would have cost a small fortune to obtain in it's original format is here for a lot less money than even the cost of one of the 45s today. Owned and operated by William Bell, of Stax Records fame and notoriety, it was a label known for the quality of it's music. It is more than ironic that it takes a record company from the U.K. or in many cases Japan to reissue this great American music that no U.S. record company felt compelled to do. It is for the quality of this and their other releases that I wish Grapevine Records the greatest success with these quality issues. 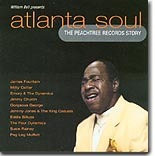 The legendary Mitty Collier is featured on four tracks here, and is undoubtedly the most well-known artist from the Peachtree roster. Having a full album and numerous singles released on the Chess record label in the '60s, her greatness shines through here, too. The only other names vaguely familiar to me were Jimmy Church and Eddie Billips. Church had the honor of kicking off the Peachtree label in 1968. His wonderful "Shadow of Another Man's Love" is a deep soul treasure and one to cherish from this release. Eddie Billups' "A Soldier's Prayer" has been featured on other compilations and is a lamenting and socially conscious ballad. A stripped down version of Jimi Hendrix's "Purple Haze," by Johnny Jones & The King Casuals, is another reason to get a copy of this great release. It is done so soulfully, that it is almost the equal of the original. Perhaps my favorite track here is by The Four Dynamics, a remake of The Spinners "That's What Girls Are Made For." It is vocal group harmony at it's finest. The production throughout is impeccable and the horns are ablaze with passion. With 20 tracks of obscure soul heaven, it is a 'not to be missed' release. On this CD of demos recorded by George Jackson at the Muscle Shoals recording studio, his immense songwriting talent is quite apparent, as is his talent as a very soulful singer. These demo recordings cut in the late '70s/early '80s, using the full compliment of the Muscle Shoals musicians, sounds better than most artists' commercial releases in both quality of material and production values. Perhaps best-known as the writer of Z.Z. Hill's monster hit "Down Home Blues," Jackson also penned such hits as "One Bad Apple" for The Osmonds in 1971. Hits continued through the end of the '70s with the top ten hit for Bob Seger, "Old Time Rock And Roll," and "It's Too Funky In Here" gave James Brown a top 20 R&B hit in 1979. 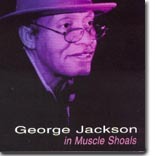 Check out any 80's Malaco album and you will surely see writer's credits for George Jackson. Outside the Muscle Shoals circle, singers such as Otis Clay continued to use his material, most notably with "The Only Way Is Up" and "Messin' With My Mind," which was recorded by both Clarence Carter and Barbara Carr. Jackson himself cites "Unlock Your Mind" as one of his favorite tracks. Written for the Staple Singers it went on to hit #16 on the Billboard R&B charts. Jackson's versions of the latter two are included here, while the Osmonds and Seger tracks are not. The inclusion of the Z.Z. Hill classic "Cheatin' In The Next Room" once again shows the quality of his songwriting, as does the O.V. Wright hit "I Don't Do Windows," also covered by Johnny Rawls on his Rawls and Luckett CD on Rooster Blues. As you can see, this is an important release in terms of documenting one of the true legends of southern soul. It is hopeful that a collection of Jackson's many 45s performed under his own name will someday see the light of day. Until then we have this wonderful release to treasure. It gets my highest recommendation.